With over 32 years spent working in the computer field, I have the experience and knowledge to help. So if you are in need of service, repair, or a new computer. 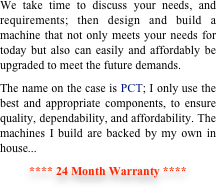 I can either design and build a custom machine, or recommend an off the shelf system for you. When it comes to repair or service, my background in programming and operation allow me to trouble shoot and diagnose hardware or software issues and get your system up and running smoothly. If you computer is running slow, I am able to remove viruses and identity stealing spyware as well as trimming the start up items, all to make you computer run as fast as when it was new. If you have suffered Data loss from failed hard drives, thumb drives, or other media, Don’t Panic. I am able to recover data on site, and PCT is also an Authorized Reseller for the Professionals at DriveSavers Data Recovery. Trying to keep up with the latest technological advances is difficult enough; At PCT I have the resources needed to keep you informed and answer your questions on the latest developments and trends. Whether you want to upgrade your current system or are in need of service or repair; here at PCT we have the most affordable Tech Bench Rate in The Rogue Valley. Written estimates are provided in advance for all repair work.